I've made this a few times now and it quickly went to the top of my husband's favorites list. The sauce on these is amazing! It has some amazing kick to it which is easy to temper if you don't like things that spicy. Baking the chicken gives it a crispy finish without the hassle, mess, and extra fat that comes from deep frying the chicken. It's a great addition to have to the recipe box. 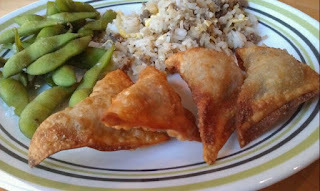 I love to serve it with some white rice, edamame, and pot stickers or chow mein. A perfect make-your-own-takeout kind of a night. 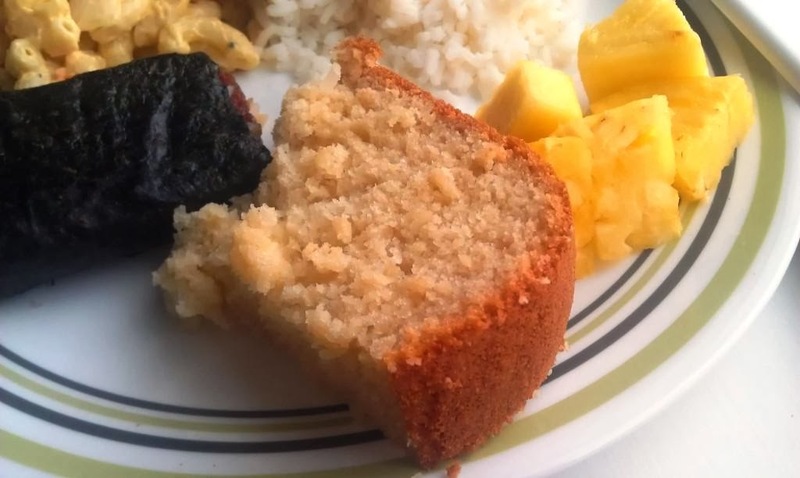 This is a great substitute for Hawaiian Sweet Bread. I love Hawaiian sweet bread but it's kinda pricey and I don't always want to have to go to the store to buy it when the fancy strikes. I love my bread machine and use it often, especially when I want to do a Hawaiian plate lunch. 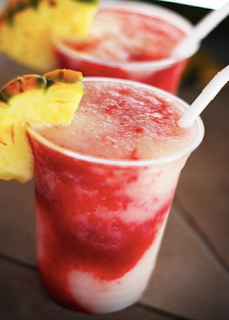 Serve this up with some fresh pineapple, white rice, and kalua pork. Add liquids to the berad pan first, then dry ingredients. Level dry ingredients; make an impression in the center and add yeast. Quarter butter and add to corners of pan. Close lid and cook on sweet bread setting. Have you ever heard of the Six Sisters' Stuff? They have a great blog and some fabulous recipes that they share. These Lion House Rolls are one I am planning on making next week for Thanksgiving. They are super delicious and make a ton which is great for the 27 people we will be celebrating with. I love Thanksgiving and the time to reflect on my many blessings. This year we got some great news regarding my husband's employment that we were not expecting. My list of blessings just got a little bit longer. I want my children to be well acquainted with their heritage. I'm so proud of all of the different countries that my ancestors hail from. A big part of every culture is the food. So I try to make all different kinds of food so my kids can have something to identify with. 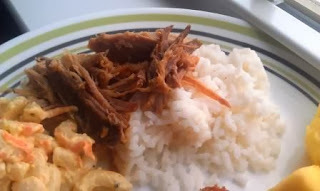 Kalua pork is one of the most well-known staples of Hawaiian cuisine. And I love that I can make it at home in the crock pot. It would be a lot cooler if I could cook it like my ancestors did but that's a bit hard in the middle of California. Yeah, this will have to do for now and perhaps someday we will make it the traditional way. Pierce pork roast with a fork multiple times all over the roast. Mix sea salt and liquid smoke together in a small bowl. Rub salt mixture all over the pork roast. Place in the slow cooker. Cook on low heat for 10 to 12 hours. Shred pork with a pair of forks and discard any fatty pieces. I didn't want to pay through the nose for some granola bars to take with us on a trip so I searched through my Pinterest to find a recipe I had everything for already. This recipe fit the bill and I loved that it was a no-bake recipe. It meant they were ready even faster. They almost didn't make it out of the pan because they were that good. I love the ability to make a lot of different kind of granola bars without having to make lots of different batches. I ended up making smores, chocolate chip, white chocolate cranberry, and butterscotch flavors and they all were awesome. This recipe uses really basic ingredients that I always have on hand which means it will be a staple in my house. The original creator gives lots of other mix in options and I would love to hear any other ideas you all have. Back in August, the day after we moved back to California it was my birthday. I have been wanting to make these cupcakes for a while now but I knew I didn't need to have that many lying around the house. So being back home with family was a great opportunity. 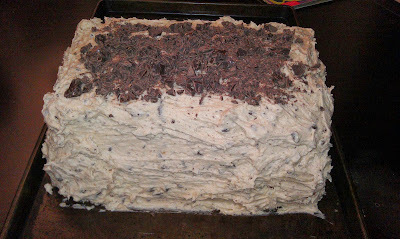 Rather than taking the time to make a bunch of cupcakes I made it into one large cake. It was just as tasty and much easier for a family dinner at home. We found this cake tasted much better the 2nd day after the flavors had a chance to meld. This cake is definitely a winner. To make it as a layer cake I baked the cake in a 9 by 13 pan. After it cooled I cut the cake in half. 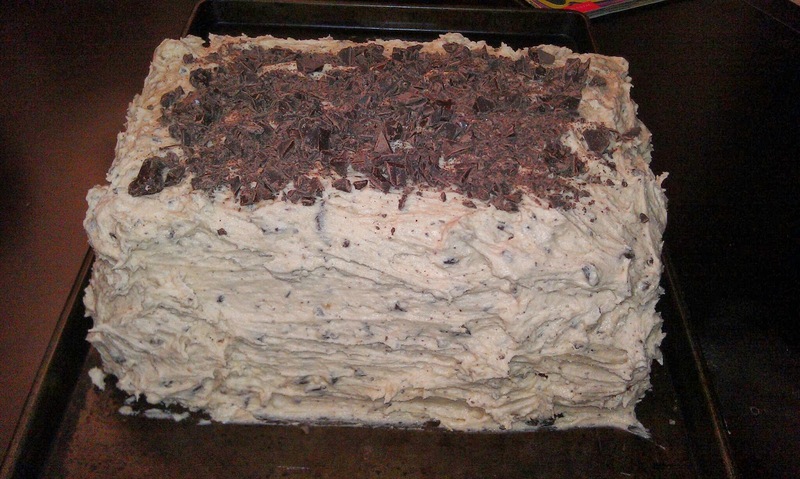 I spread the filling on top of one layer, placed the other layer on top and then frosted the whole cake with the cookie dough buttercream frosting. I mixed some chopped bittersweet chocolate into the buttercream frosting. It was a little harder to spread but I really liked having the chunks in it and it was faster than pressing chocolate into the sides. I sprinkled the top with my leftover chopped bittersweet chocolate. You can't have too much chocolate right? 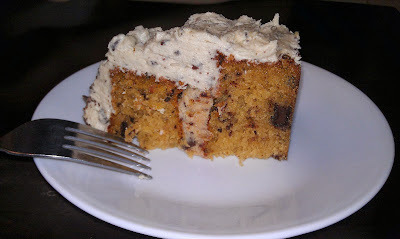 I think I need to find a reason to make this cake again because it is a total winner. This is another great recipe from Miss Emily over at One Lovely Life. 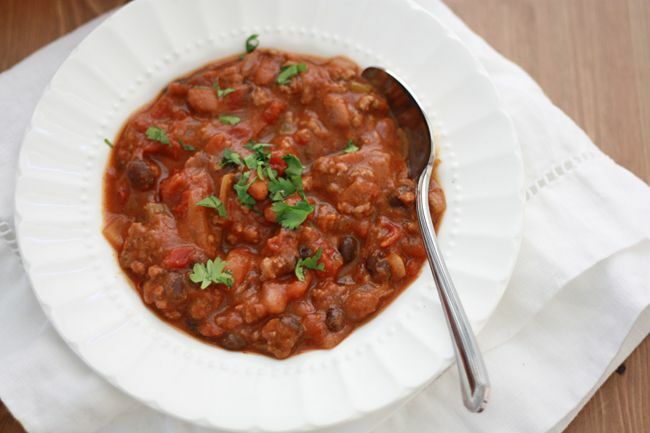 I love the added nutrition the pumpkin puree gives to chili and it added just a hint of the pumpkin flavor but not enough to make you overwhelmed with pumpkin. 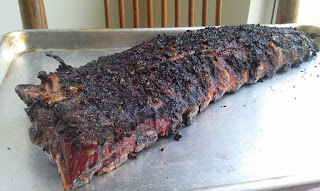 I'm thinking this would be really good with some squash puree too. I'll have to try it that way and let you all know how that goes. It's a great, quick, weeknight meal that is super hardy and I always love something warm on a cold night. I always enjoy a good recipe that is just as good meatless as it is with meat. It is super easy to change up the meat in this to be lighter using ground chicken or turkey or do as Emily suggest and add some beans to make it vegetarian. So many options from a simple recipe. I love to have a variety of quick breakfast options on hand and I like to have them be as healthy as possible. My kids follow in my footsteps and love chocolate but my hubby is more into tangy flavors. 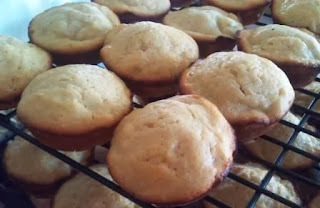 So I make peanut butter chocolate muffins for the kids and I and my hubby loves these Lemony Yogurt Muffins. These muffins are hearty while still feeling light and with Greek yogurt and some whole wheat flour they have a little extra health packed into them. Whisk the dry ingredients together, including the lemon zest, in a large bowl. In a separate bowl, whisk the wet ingredients together. Pour the wet ingredients over the dry ingredients and gently but quickly stir it all together. A few lumps are okay and definitely don't overmix. Scoop batter into a greased muffin tin or into liners in a muffin pan. Bake at 400 degrees F for 18 to 20 minutes until muffins are golden. Cool for 5 minutes and then turn out onto a wire rack to finish cooling. I store these with no liners in the freezer in a Ziploc bag. They reheat well in the microwave or just when left out to thaw. There is nothing like homemade bread and this is another great bread just like last week. I love the aroma this bread gives while baking and it's a great addition to a dinner in. 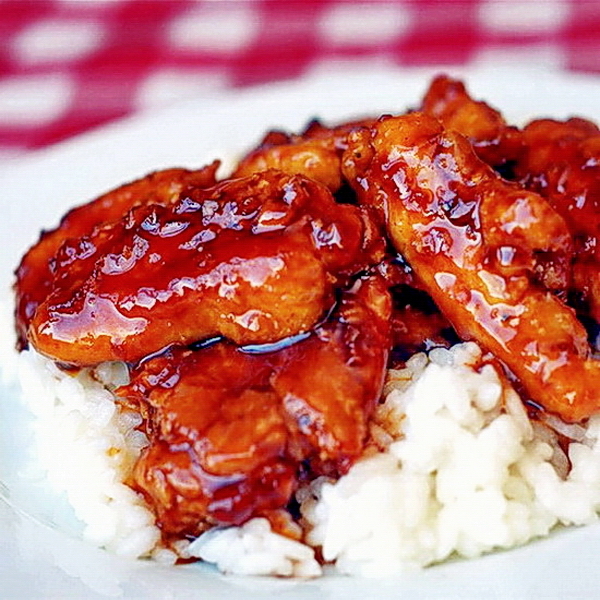 It's a pretty simple recipe with great flavor. And I love how it seems fancy without the work.